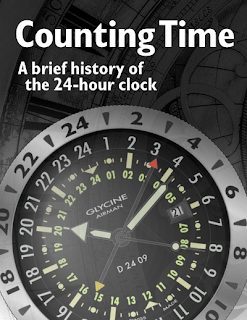 Although this free electronic book isn’t strictly about the 24-hour analog clock, but about the 24-hour time system, it has some relevance to the clocks and watches displayed on this site. If you have an iPad or iPhone or iPod Touch you can download it directly onto your device into the iBooks app from a link on this page. If you have some other kind of eBook reader, you may be able to download it if you can load ePub or PDF books. Either way, let me know!